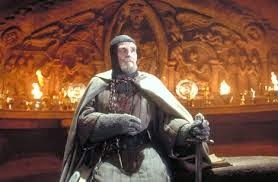 In Indiana Jones and the Last Crusade, there is a scene near the end in which, when the whole place is crumbling, the knight who was the guardian of the Holy Grail salutes Indy through the falling debris and dust. I wept when I saw that scene in the theater in 1989. I like that. I was 21. Anyway, if I listed those works that "moved" me, some would be no surprise: "Afternoon of a Faun," by Debussy; The Pines of Rome, by Respighi; Miller's The Crucible and Death of a Salesman; Hemingway's The Old Man and the Sea; Ravel's Mother Goose suite... I could do this all day. This memory makes me miss my young self just a little. But not a lot, because he still lives on the first floor of my brain. The present me lives on the floor above him, but the young me is still down there, blaring his stereo and lying in hammocks dreaming of "something more" to everyday life. He keeps in touch via email. Sometimes he comes up for a drink. But he is always close by. At the age of twenty-one, I was quite the student of medieval literature. I was sort of wrapped up in the idea of inner-nobility; the whole Galahad thing. Being brave, being truthful, being reliable, being honorable were things I saw (and still see) an extreme dearth of in my world and the only glimpses of these things that I saw were in the stories of chivalry and knightly pursuits. I wanted what seemed to live only in stories to be part of the real world; of my world. When the knight saluted Indy, who had gotten the grail for the right reasons (to save his father); who had used his wits to identify the poorly-wrought, second-rate artifact as "the cup of a carpenter," he (the knight) was saying: "You are one of us -- the worthy; the pure of heart." We tend to pine for our youth for the wrong reasons. This is not an "eighteen 'til I die," Bryan Adams kind of thing. (God, that song is embarrassing.) What I miss about youth is stuff I try to hold onto: sincerity; self exploration; a sense of spiritual and intellectual wonder. I have watched so many artists and average Joe's age themselves into sterility or, at least, into the direction of insincerity or constant cynicism. Though I have always respected the man, I think Billy Joel is a great example of someone who, at least as evidenced by the work itself, seemed to think his early work was "sappy" or "sentimental." But, I'll tell you -- I would much rather hang out with the young guy who wrote "She's Always a Woman" and "Honesty" than with the guy who wrote "Pressure" and "We Didn't Start the Fire." All good stuff...but the latter works? They're just too grown-up for me. Anyway, I'd rather be weepy than cold. Hail to you, oh Nerdy Knights of the Secret Handkerchief. There'd more happiness in the world if people thought like us.